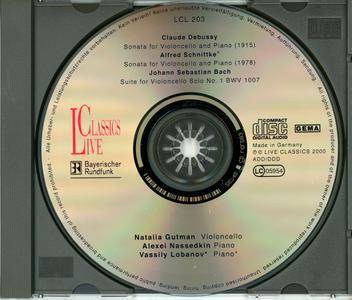 Live Classics’ Natalia Gutman “Portrait” series continues with a second volume documenting the cellist’s work from her early career up to the present. 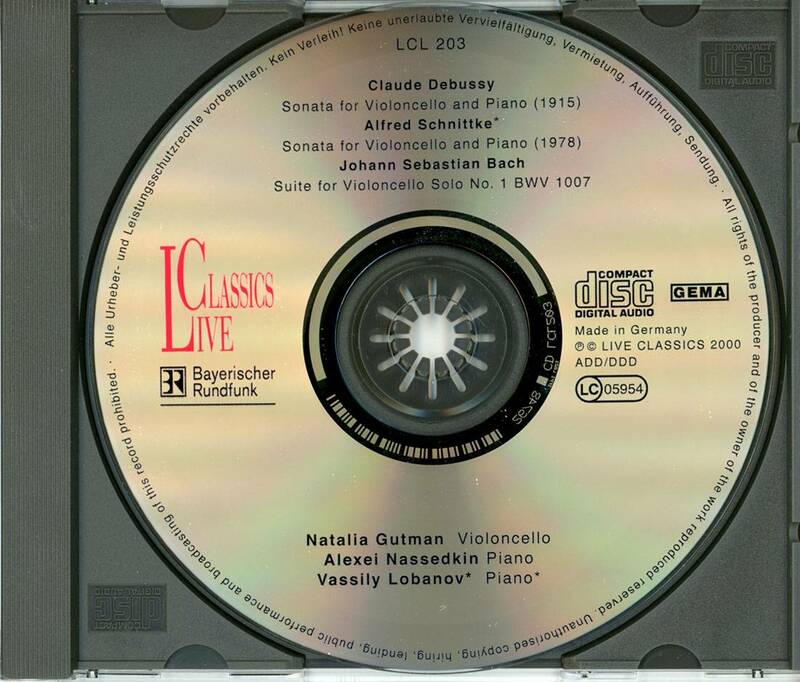 A 1967 German radio broadcast of the Debussy Cello Sonata stands out for Gutman’s warm, expansive tone and strong, fluid support from pianist Alexei Nassedkin. A few moments of uncertain intonation and less-than-centered articulation in the second movement’s opening pizzicatos are a small price to pay for fine overall ensemble values. Gutman shines in the declamatory, slow-motion passages that dominate the outer movements of Schnittke’s First Cello Sonata, and throws herself head first into the central Presto’s roller-coaster arpeggios and ruthless clusters. A gripping performance, this: every bit as authoritative as Alexander Ivashkin’s with the composer’s widow Irina Scnittke at the piano. She’s a more sensitive colorist than Gutman’s solid yet comparatively monochrome Vassily Lobanov. The Bach G major Suite is hit and miss. Gutman’s self-conscious rubatos and teasing holdbacks in the Prelude obstruct the music’s harmonic continuity, while the soft-grained Sarabande wilts at its center. Yet the Counrante, the two Menuets, and Gigue lightly dance off the cellist’s bow with no fuss and all beauty. The sound is excellent for archival source material. Worth hearing. 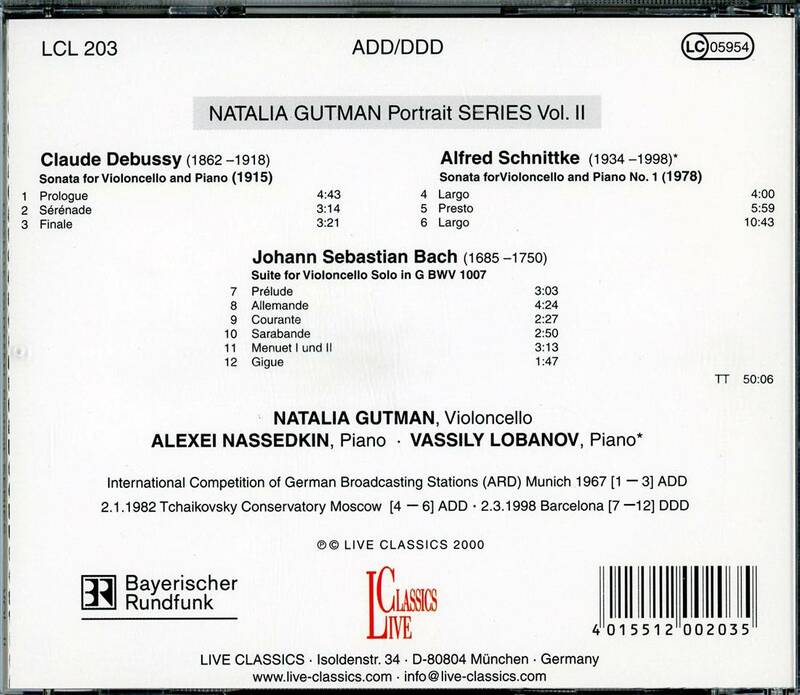 Born in Kazan into a family of musicians, Natalia Gutman received a cello shortly before her fifth birthday. Upon moving with her family to Moscow, she studied with Galina Kozolupova and as a graduate (‘aspirant’) with Mstislav Rostropivich. “He took his teaching very seriously. We didn’t have that many lessons, but each of them was an unforgettable experience. He took all the time in the world for each student, and he adapted his methods to the particular needs. He showed an infinite imagination for finding the right image.” Natalia´s grandfather, violinist Anisim Berlin (a student of Leopold Auer) was another big influence during her formative years, as was Richter, whom she first heard play at the age of 14. “Instantly, he seemed a kind of musical god to me. 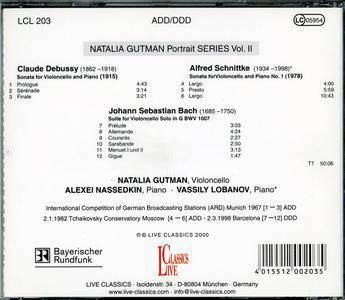 I could hardly believe it when I was able to play with him years later.” This admiration was reciprocal: Richter (who died in 1997) once expressed his admiration for Gutman by calling her ‘an incarnation of truthfulness in music’. Fellow cellist Gaspar Cassadò waxed lyrical about her as ‘a delicate flower, with the roots of an oak’. By the time she studied with Rostropovich, Natalia was already an old competition hand, having won the gold medal at the Vienna Seventh World Youth Festival in 1959. In 1964 she took Third Prize in the Tchaikovsky Competition and two years later won the International Dvoràk Competition, held as part of the Prague Spring Festival. 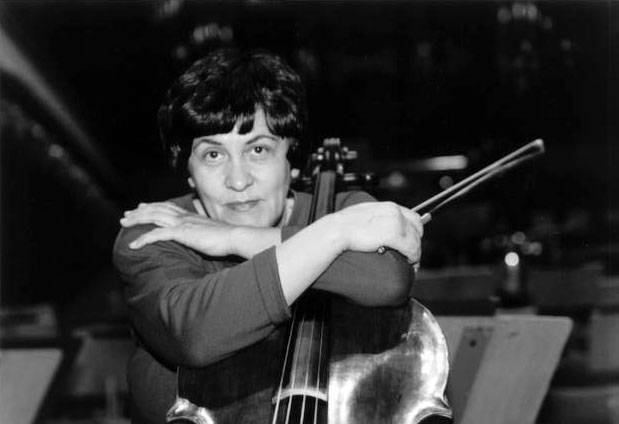 A major breakthrough came in 1967, when she won the ARD (German Radio) Competition in Munich, typically not in the solo category, but as a cello and piano duo (with pianist Alexei Nassedkin). “The jury came to us after the semi-finals and started congratulating us; we were expecting to be told what to play in the last round, and it only dawned on us slowly that they had already awarded us the first price!” Reporting on the competition, the Munich press spoke of ‘chamber music in its most sublime form’ and of ‘playing which combines the highest art with the most intense expression. 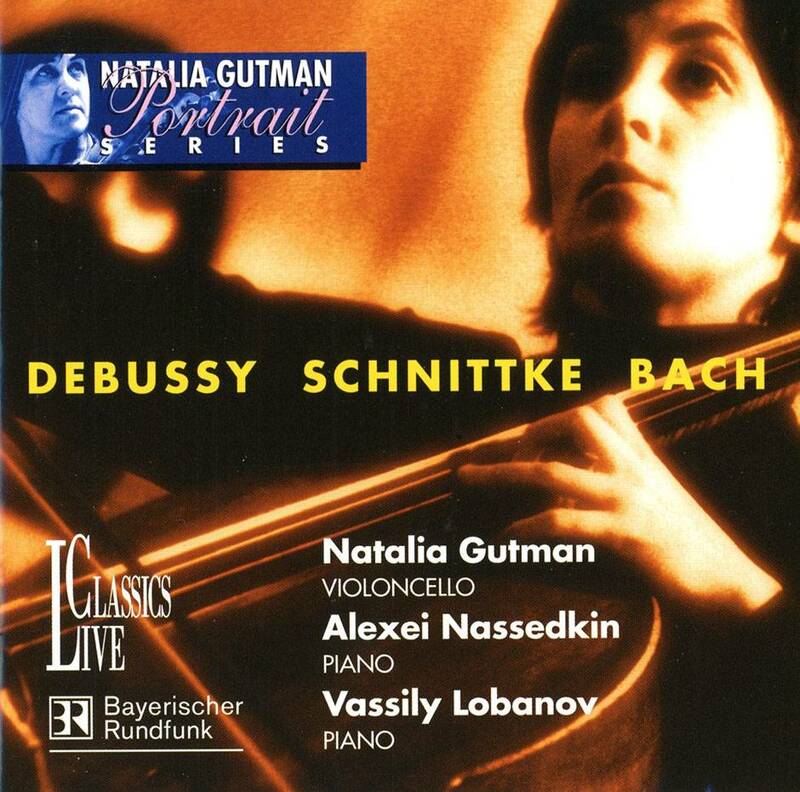 Natalia Gutman is surely the most self-contained cellist we have ever heard; she is a past mistress of that elusive art of holding back in sheer volume without losing expressive force or intensity.’ The Debussy Sonata played at this competition has been published on LCL 203.